An Interview With. . . Sue Reno! 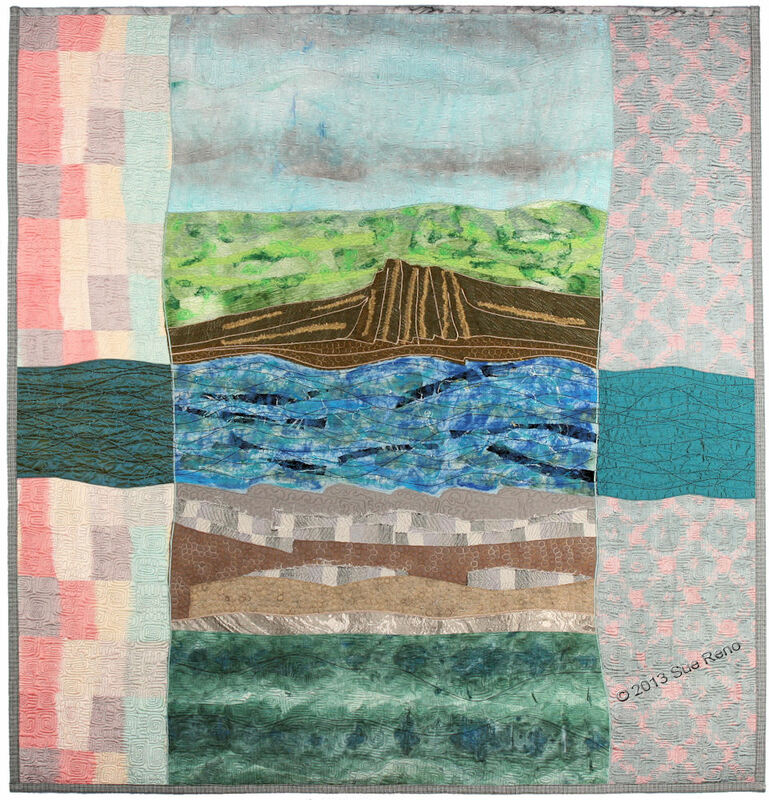 Every once in a while the work of a quilter captures my attention in a way that speaks to my heart and head. Then I get to meet the quilter. Ah yes, there is a level of comfort in the conversation that is just well, very cool indeed. And this is how it is with Sue Reno. We see each other about once a year and I love to see her, to stand in front of her quilts and talk about them. Teri: I cannot tell you how much I enjoy your morning photos on Facebook. How does the photography influence & inform your quilts? Sue: Thanks Teri! I very much enjoy taking and sharing photos on an (almost) daily basis. It’s an integral part of my artistic process. It forces me to stop and actually LOOK at my surroundings and appreciate them. I also enjoy the comments and feedback I get from my Facebook friends. I mainly use my iPhone, with clip on lenses, and edit the photos with my phone or iPad as well. I specialize in macro photos of the plants and flowers in my garden and local parks, and landscape images I capture with a fisheye lens. Both types have a way of either revealing more depth or distorting the way I usually experience reality, and I find that very helpful in training my eye and expanding my perceptions of what I can express with my artwork. Some of the photos serve directly as inspiration for my art quilts, like the series of River themed quilts I am currently working on. Others have a way of settling in my subconscious due to their color palettes, or their composition and design. But mainly they remind me to be open and responsive to the changing and temporal nature of my environment. Teri: Can you tell me a little bit about the cyanotype process and how you incorporate it into your quilts? Sue: Cyanotype, or blueprinting, was one of the earliest photographic processes. It involves treating paper or natural fiber fabric with a chemical solution that makes it responsive to UV light, similar to analog film. I take the treated fabric and mask it with either natural objects, like leaves, or acetate sheets printed with my digital images that serve as photograph negatives. I then expose the fabric to sunlight for a timed exposure, generally about 10 minutes, remove the mask, and rinse the chemical from the fabric. The areas that were exposed to UV light turn a beautiful Prussian blue color. I’m in love with the process because it always seems so magical, and the results are just a bit unpredictable and surprising, in a good way. 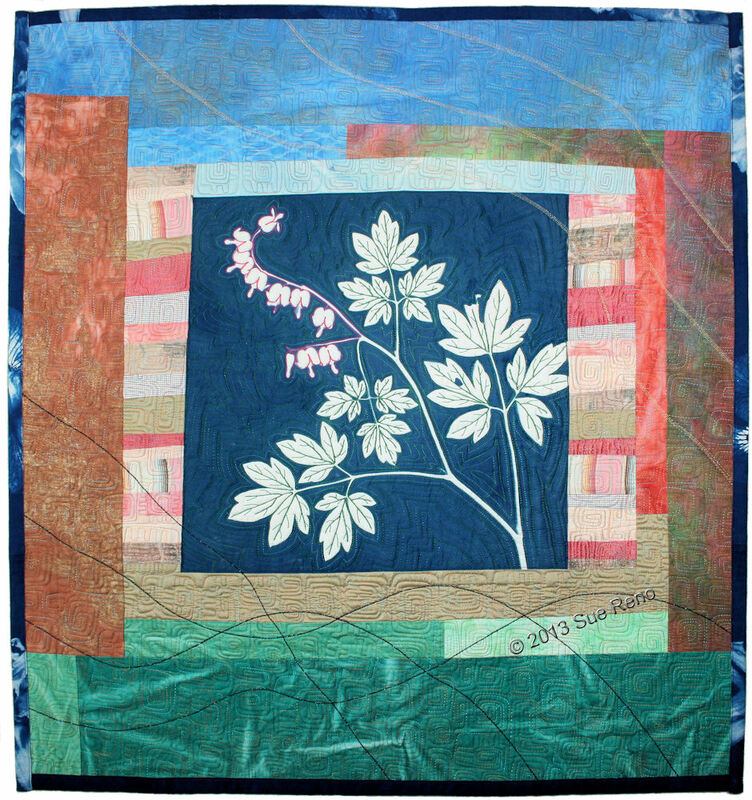 It’s a great way to capture the fine and fleeting details of leaves and flowers, and is also a good fit for my architecturally themed quilts. Teri: Did you start out making quilts for beds and move into art? Sue: Yes, I started out as a teenager using very traditional practices, back in the dark ages before rotary cutters were invented. I cut squares and strips with scissors, and did hand applique, hand embroidery, and hand quilting. I get impatient and bored with commercial patterns, so I always modified them or drafted my own. As time went by I began to experience some repetitive stress injury symptoms, so now I save the handwork for occasional beadwork. 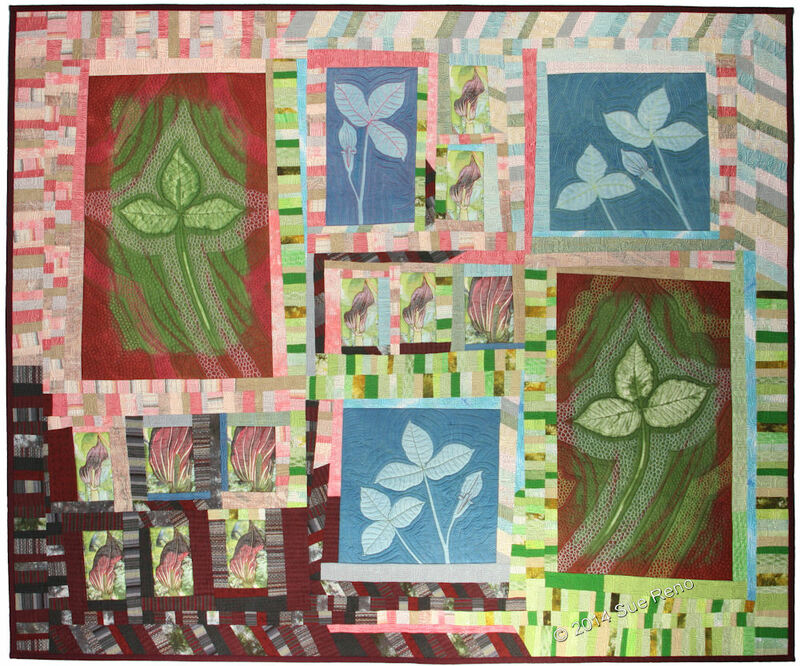 And the move into art quilting was a very natural progression for me; I just kept exploring and expanding the possibilities of creating my own designs. 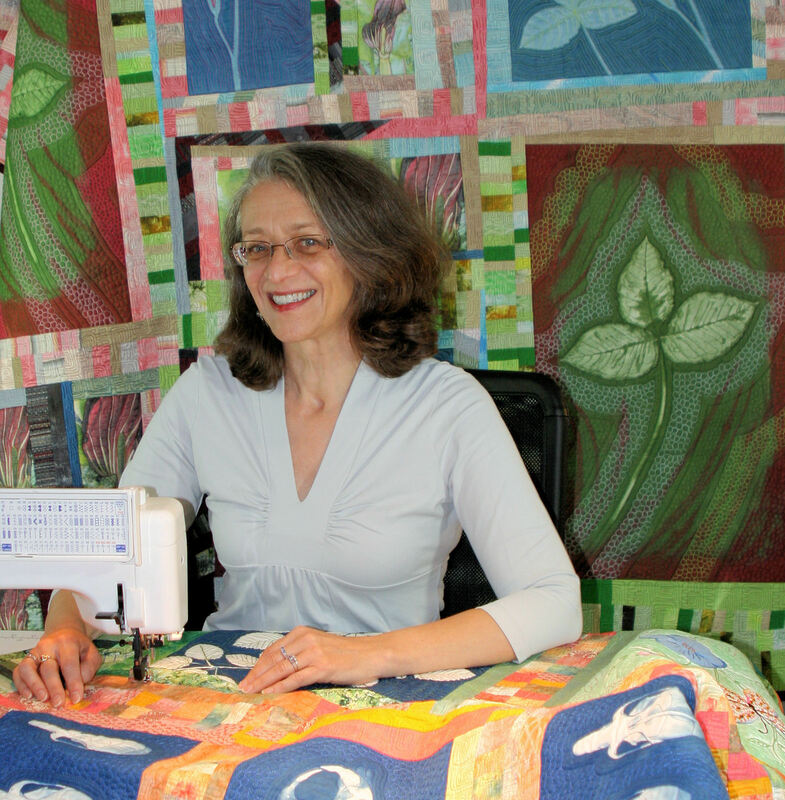 Teri: Do you quilt on a long arm or domestic sewing machine? What machine do you use? Sue: From time to time I hear the siren song of the long arm machines, but I always resist. I do all my piecing and quilting on a domestic machine. I had several Pfaffs, and now I work with on Janome 6600. 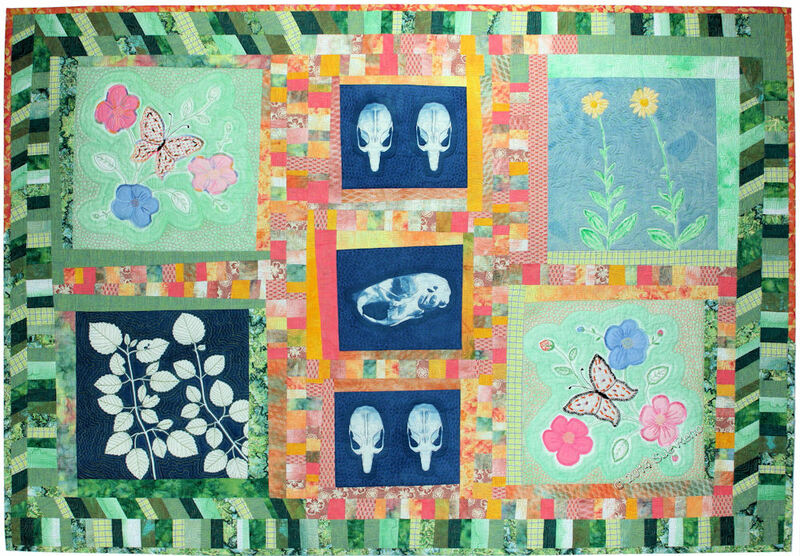 I have a variety of working methods that make even large quilts manageable—for example, I will do intricate echo quilting on a cyanotype print before incorporating it into a top, then come back and stitch the high points on the second round of quilting. It actually adds more texture and relief into the work. And I like the intimacy of working up close and personal with my quilts. I don’t know that I would benefit from making the process faster or easier. Teri: How important is the quilting to the overall impact of your quilts? Sue: Very important! Although I use a lot of surface design techniques in my work, and am primarily concerned with the overall impact of the design and the emotive content of my work, I remain a consummate craftsman. I am very picky and meticulous about my workmanship. 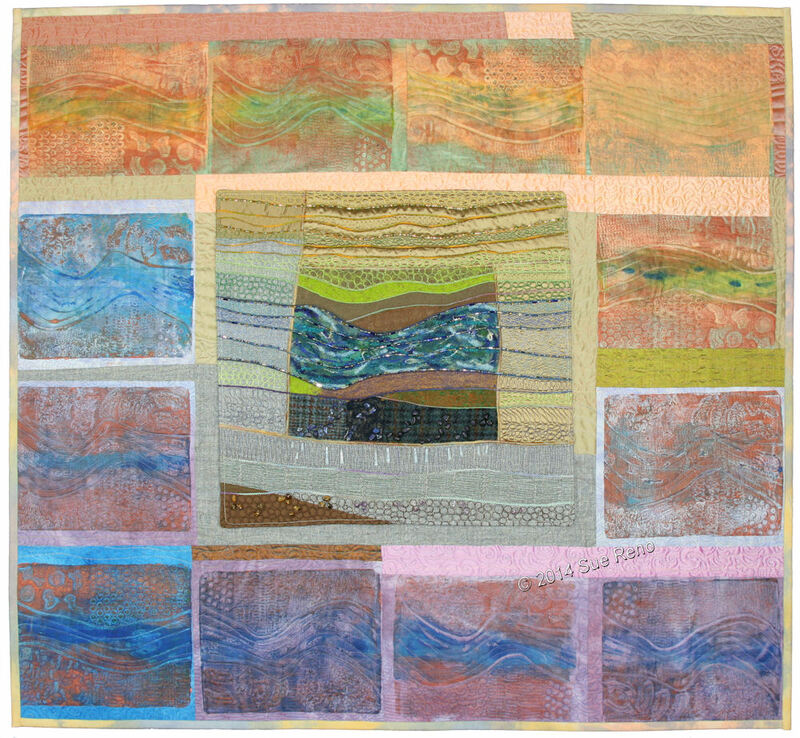 My work is pieced and/or appliqued, not fused, and the quilting plays a primary role in the overall look of the work. I love the way it blends and unites the patchwork and highlights the imagery. I like the textural effects I can achieve by varying the quilting stitches and intensity. That being said, I am not striving for “perfection” in my quilting. I want there to be the slight variations in stitch length and patterning that are unique to my style. It’s like the difference between the printed page and handwriting—my quilting is my signature. American Quilter Magazine, March 2014 issue, “The Hand of the Maker” profile, and “Cognitive Textile Artist Process” feature article. Previous postso how are you going to WOW your quilting today?